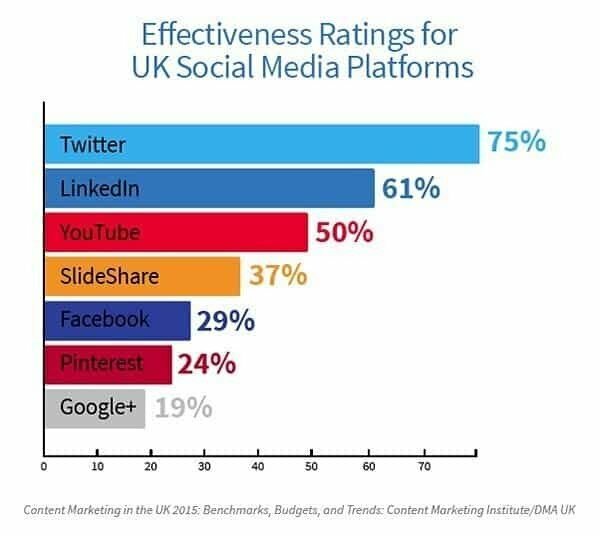 Seventy-five percent of content marketers surveyed in the United Kingdom say Twitter is effective for them. This is the highest effectiveness rating ever for a social media platform in all the research done by the Content Marketing Institute (CMI). That’s just one of the eye-opening findings in the new research, Content Marketing in the UK 2015: Benchmarks, Budgets and Trends, from CMI and the DMA UK. This is the third year for one of the most highly-anticipated content marketing research reports in the UK. This year’s survey, sponsored by Axonn Media, looks at how UK for-profit marketers (both B2B and B2C) approach content marketing as compared with last year. Aside from getting great results from Twitter, another prominent finding from the survey is that UK marketers are much more focused on their goals for content marketing and that those goals have changed. Even so, creating engaging content is one of the top challenges for UK marketers; yet, many are working on initiatives to improve in that regard.